Tampa Bay Lightning Defensive Pairs: Who should play where? The coaches in Tampa have lots of options on the blue line. Share Tampa Bay Lightning Defensive Pairs: Who should play where? 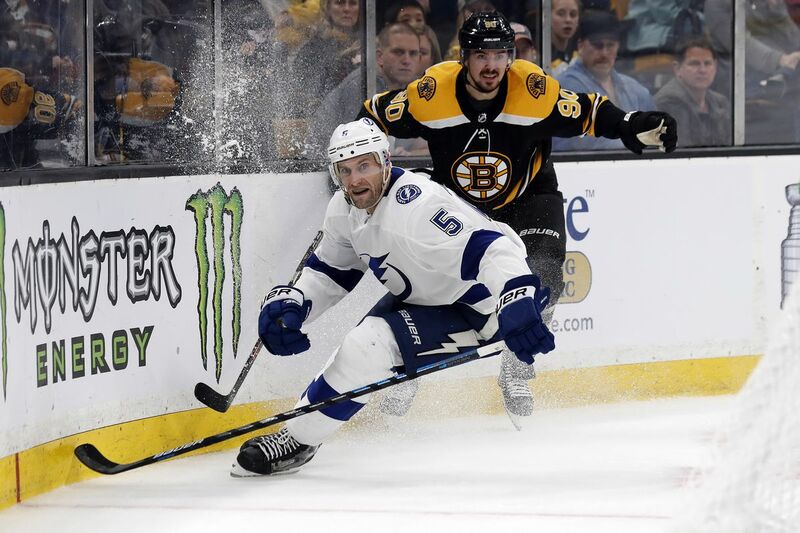 The Tampa Bay Lightning play the second game of their opening round playoff series tonight against the Columbus Blue Jackets. After a disappointing loss in game one, the most frequent topic of conversation has been the defensive pairings. Braydon Coburn was a surprise healthy scratch in favor of Jan Rutta in game one. Coburn was a regular all season but appears to have been supplanted by Rutta in the coaches eyes. After a rough first couple of years in Tampa, Coburn has regained favor over the last two seasons playing on the third pair with Mikhail Sergachev. The two have been at least good and at times dominant against opposing teams depth. The other flash point has been Dan Girardi’s return to playing alongside Victor Hedman. Girardi missed some time with injury toward the end of the regular season but upon his return, slid back into his normal role. While he technically plays on the top pair, he doesn’t play top pairing minutes. He’s been anywhere from fourth to sixth among defenders in TOI this season depending on how the coaches utilize the rest of the lineup. In practice this morning, Anton Stralman returned to skating with the team. That’s an indication that he’s close to returning. When he does, he’ll present a new wrinkle. The coaches will need to decide if he returns to the lineup or if he remains a healthy scratch. He could take the place of either Girardi or Rutta but neither seems guaranteed given his struggles this season. After a bad loss, calling for the return of Coburn and/or Stralman when he’s healthy is understandable. But let’s take a quick look at the numbers to see what we can find about the different options the coaches have. For this exercise, let’s assume Ryan McDonagh and Erik Cernak are locked as the second pair. They’ve played the most minutes together of any duo on the Tampa blue line this season and have excelled in those minutes. I don’t see any reason the coaches would split them unless they can’t make the other pairs work at all. With that assumption, we now need to decide who will be Victor Hedman’s primary partner and who will play on the third pair with Mikhail Sergachev. The options are some combination of Girardi, Coburn, and Rutta. And obviously, the same player can’t fill both roles. The following chart shows the expected goal share for Hedman and Sergachev with the various options for partners so far this season including the playoffs. The horizontal axis is constrained to a reasonable set of values but does exaggerate the differences a bit so be aware of that. The color of the bar represents the amount of time that pair has spent together. Light gray is very little time and dark blue is lots of time. All data is via Corsica. The most striking thing here is how much it aligns with the decisions the coaches have been making. Despite what you might hear, Hedman and Girardi has been a solid pairing all year. Yes, that’s mostly because Hedman can carry almost anyone. 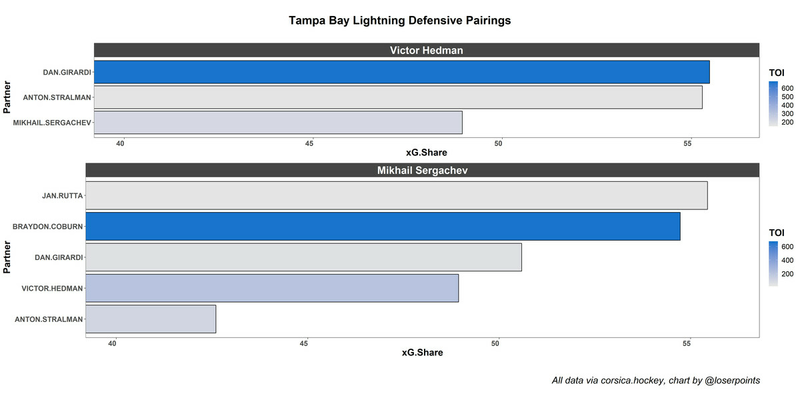 But for comparison, Hedman’s results with Stralman have been nearly identical and in fact, slightly worse. Expected goals have already been adjusted for zone starts here so that isn’t driving the difference. The sample sizes are small enough that variations in teammates and competition could be having some effect but the most likely explanation is just that the team gets similar results whether Girardi or Stralman plays with Hedman. Moving down to Sergachev, again we see the coaches deploying what appears to be the optimal pairing. For context here, the sample with Sergachev and Rutta is extremely small, a little over a half hour. But in those minutes, they’ve played well. Slightly better than Sergachev played with Coburn and much better than any of the other options. The sample is so small that one bad game could vastly change what we see here but so far, we’re not seeing much to suggest that the coaches are off base in their decision making. And that’s the common theme in the data here. As far as I can tell, the coaches are making the optimal choices. After a loss, wanting to go back to the familiar pairing of Sergachev and Coburn that worked all season is understandable. But so far, the numbers don’t support that idea. And if we dig further, we get more evidence that Rutta is a better option. He’s been better by Wins Above Replacement via Evolving Hockey than Coburn this season. His larger sample performance combined with his small sample results with Sergachev points to him being the better player on the third pair. The area where Coburn makes a strong case is on the penalty kill. He’s been very good there this season and Rutta is not nearly as effective if called on in that situation. But with the top four defenders, getting most of those minutes, that’s less of an issue. Once Stralman returns, the coaches will have a more difficult decision. He and Girardi seem to be at similar points in their careers. Veteran players with something to offer but who need to play with a strong player and have their minutes managed. If you ask my personal opinion, I’d like to see him come in for Girardi but I can’t make a strenuous argument to that effect and Girardi is equally deserving if not more based on the evidence. The one thing that would appear to be obviously suboptimal would be to put either Stralman or Girardi on the third pair with Sergachev. At this point, only one of those two should probably be in the lineup and the one that is should be with Victor Hedman. For tonight, we’ll see the same pairs as we saw in game one and that’s probably the right call. But things will get more complicated when Stralman is ready, which could be as soon as game three on Sunday.